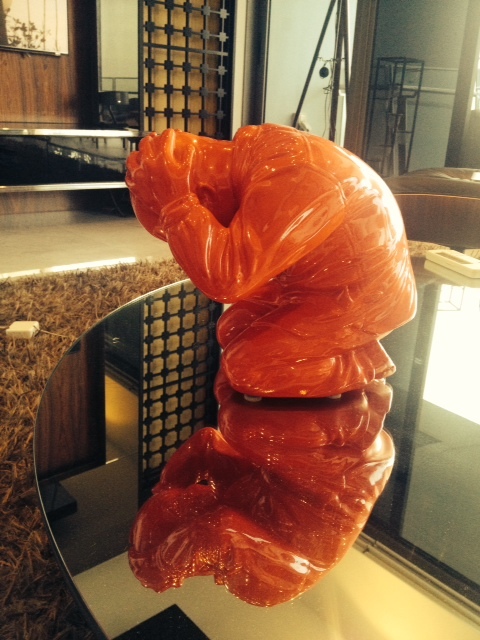 I have this sculpture by Ma Yue in my living room. 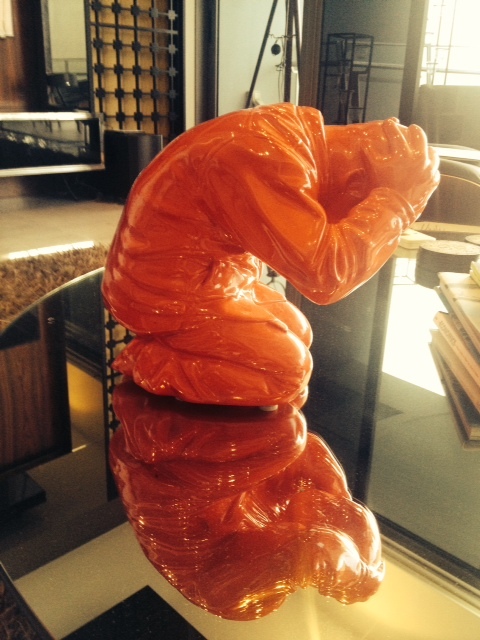 When I first saw it in the gallery in 2009, I was instinctively drawn towards this helpless crouching figure with his hands protecting his head bent so low in anticipation of somebody hitting him. There was something so evocatively tragic about him that made me want to reach out and protect him. The gallery also had an exhibition of his paintings titled “Cowering series”. 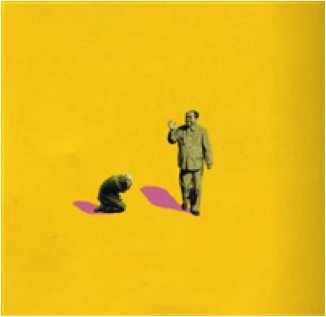 In this series, Ma Yue uses the same figure of the man against a vast expanse of colour, some times alone, some times with the company of similar crouching figures and sometimes alongside popular Chinese political icons. The tiny crouching figures in the back ground of a single colour poignantly communicates the smallness and helplessness of a common man against a more larger & powerful backdrop of his environment and with the occasional a usage of political icons, against a more powerful personality. “Ma Yue concentrates on a single subject, the crouching figure, faceless and powerless, though with a different background and circumstance each time. Here are a few images from this series. And now for some Vedanta. “Now this Sruti teaching we can broadly classify into two parts. The first part of the Sruti or the Veda deals with our common problems in life. Every human being while living is going to face lot of situations in life which create lot of mental problems, emotional strains, worries, depression. Only you have to talk to an individual how are you? Then the stories will come. If it is in the bus stop, he will say fine. If you call him home or go to his house and over a cup of coffee enquire, stories will come. My son is like this. My daughter is like this or daughter-in-law or son-in-law or husband or family, etc. So this emotional problem is unique to human being. The animals do not face these problems. They do not feel the separation from their children. They happily grow up and they happily get separated. You do not see a cow crying because the daughter or the child going somewhere else. So the first part of the Veda deals with the mental problems of human being. And if you analyze, most, why most, all our mental problems can be reduced to one basic problem i.e. we are not able to accept some of the situations that we are facing. If you take hatred, you will find I hate a person because I am not able to accept his behavior, his character, his way of life. If you take anger or irritation again you analyze, it can be reduced to one problem, I am not able to accept my son’s behavior therefore, I am angry. Take jealousy problem, again we can trace down to one thing, I am not able to accept my neighbor’s prosperity. I am not able to accept my neighbor’s son getting first rank and my son getting second or third. Thus, you take jealousy, you take hatred, you take fear. What is fear? I am not able to accept the future that may come to me. So certain situations I do not want to come to me and if it comes, I will not be able to accept and this non-readiness to accept future situations is fear or anxiety. So my son is writing IIT exam, I am anxious, means what? I will not be able to accept if he does not get admission there. Thus you can see, all our emotional problems can be traced to one fundamental problem that is, when faced with a certain situation in life, certain people in life, certain things in life, I am not be able to accept. Now Veda tries to give lot of Pariharams for these situations. In fact, varities of rituals are prescribed, varieties of Poojas, varieties of Japa, Tapaha, pilgrimage because Veda believes that many of the situations can be changed, cured, remedy is possible. But Veda itself accepts one thing that for many situations, remedies are there but there are many other situations for which there is no remedy. That is why we divide our Vidhi or Prarabdha into two types, Durbala Prarabdha and Prabala Prarabdha. Durbala Prarabdha means a weaker problem, a weaker situation over which I have control, I can use my freewill, I can work out a solution but there are certain types of Prarabdhas or Karma which we call Prabalam wherein you find, you do Pooja, you do pilgrimage, charity, some people tell Swamiji we tried everything but nothing is working out. I have tried astrology method, palmistry method and Pakshi Josyam method including black magic. Some people try that also. Now Veda accepts that there are certain Apariharya artha to use Krishna’s expressions – “Tasmaat apariharye arthe’. Apariharya means there is simply no remedy. And it is simple common sense that what cannot be cured, should be endured. You do not require a great logic for that. It is simple fact. But here alone we face a problem. We know that we have to accept. We know that all doors are closed and we have no other way out but to accept. We know the intellectually it is for me to accept. But my mind refuses to accept. So here in we find that the mind is incapable of facing the situation, even though I know I have to face it. It is illogical not to accept the situation. So when such an emotion, pain, depression, frustration, etc. comes, what is the logic behind it? There is no logic behind frustration because logically if you analyze, I should accept it. I know I should accept. This person himself has fixed the son or daughter going abroad. He has fixed for higher studies and is crying. I asked “why do you cry?” He says his son is going away or daughter is going away. I said you yourself have fixed this, then do not send him. No No I want him to study. So you only have planned, you know it is for the good of the son or daughter then why do you cry. Yes, I should not cry. Then why do you cry. What to do I have to cry. So we find a situation where whatever logical arguments we give, those arguments do not seem meaningful. The mind continues to have depression, frustration, etc. where intellect itself fails to solve the emotional problems. When there is such an emotional problem, mind is not able to face even when intellect tells that there is no other way other than acceptance. Then what can be done? We have said nothing can be done with respect to situation. And therefore, there is only one way, that is the mind has to accept. But I know mind has to accept but I am not able to accept. So then we say that if the mind is not able to accept what it has to accept, it only means, the mind is weaker. All emotional problems are indications of not a weak intellect. Intellect is wonderful, brilliant, sharp, capable of analyzing even Vedas under depression. A depressed person analyzes Vedanta that means intellect is not weak or nothing, the mind is not strong enough to face what it has to face. As I was sitting my chair and listening to this talk, my eyes fell on Ma Yue’s sculpture once again and in one moment of epiphany, grasped the meaning of surrender when faced with a situation of choicelessness. The most striking thing of Swamiji’s talk was the way he explained that for a non logical problem, there can only be a non logical solution and that is faith. Its faith that gives you the emotional strength. If you surrender to a larger force Ishvara or to a personal God with faith, one can deal with any choiceless situation with greater emotional strength. 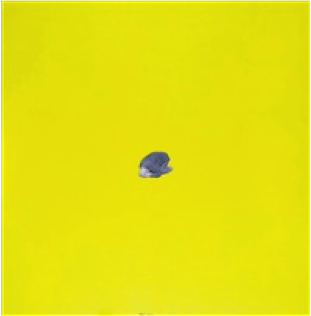 As I looked at his paintings once again, I saw the tiny figure crouched in surrender to a personal god, instead of a political icon, to Ishvara instead of a vast expanse of colour, for now in that colour I could see the entire Jagat or Ishvara. Finally, unlike the original intention of the artist, of the figure being powerless, I could actually see an inner strength emanating from faith. Through a ‘Crouching Figure’, I discovered ‘Hidden Faith’. personally an eye opener for me. Thanks.